Tributary run-off is probably one of the most important factors influencing a successful steelhead trip. So important that many guides in the Lake Erie region routinely fish all three states of Ohio, Pennsylvania and New York in order to be on a steelhead tributary with the best run-off for that specific day or days depending on how long the “prime conditions” last for that particular tributary. What exactly is tributary run-off and how can the steelheader use it to his advantage to increase his success on a Great Lakes tributary through the course of the fall, winter and spring steelhead seasons? Run-off as defined in the dictionary is an over-flow of fluid or in the case of a Great Lakes tributary stream, an over-flow of water above its normal base flow. In the Great Lakes region tributary run-off is typically an episodic event (usually once or twice per week) and the result of a passing weather system that brings rainfall in the fall and spring months or a melting of snow and ice during the winter months due to increased air temperatures and/or rainfall. These events create surface water which drains into a tributary watershed increasing its flow substantially. There are exceptions to this, including some of the north shore tributaries of Lake Erie in Ontario where surface water run-off is not really relevant. Ontario tributaries like Big Creek and Young’s Creek require much more rain or snow-melt before becoming unfishable due to sandy soils. These porous soils prevent run-off and facilitate clear and cold groundwater seepage on a steady basis (and even then do not become muddy but just tea colored). Tributaries on the southern shore of Lake Erie normally have low and clear base flows due to poor groundwater flow and for the large part are entirely dependent from surface water run-off to reach flow levels ideal for steelhead fishing. Some of the tributaries (like the Grand River in OH) have dams on them but they don’t provide much of a minimum base flow. These periodic run-off events affect the tributaries in a number of ways during the course of the steelhead season. They include bringing up the flow to more fishable levels for performing techniques and presentations, increasing steelhead holding and resting areas, facilitating the movement of fresh steelhead from the lake into the tributaries, helping the migratory movement of steelhead upstream toward spawning gravel and energizing older fish that are already in the tributaries. 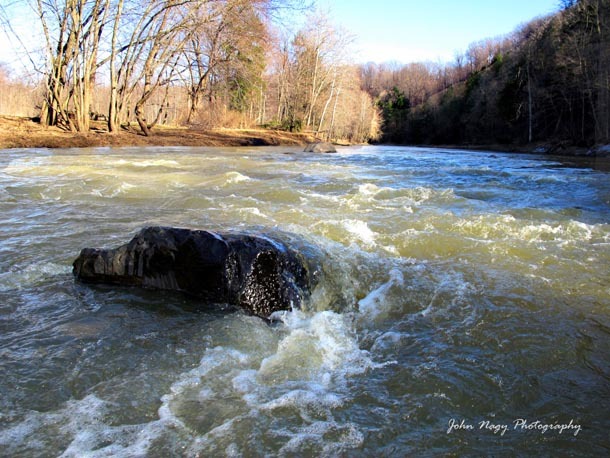 Peak run-off levels on most tributaries are a muddy torrent with few fishing opportunities. As stream levels drop, the water clarity improves and the best run-off conditions occur. I call these conditions “prime conditions” due to the more fishable flows for both wading and fly presentations as well as a green tinted water coloration which is characteristic of many of the southern shore Lake Erie tributaries as they clear. 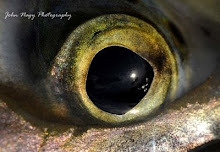 In this type of water clarity steelhead are easier to catch because their visibility is limited. They can see your fly offering, but not too clearly. These ideal conditions can be short lived and vary in length from only several hours (indeed a small window of opportunity!) to a few days or as much as a week or more depending on the amount of run-off received, ongoing weather conditions, water table levels (current ground saturation) and the run-off characteristics of that particular tributary watershed. The tributary run-off characteristics or “run-off rates” are very important in predicting how a specific tributary will run-off to prime conditions after receiving precipitation from rainfall or snow/ice melt. Based on my observations over the years I have summarized the run-off rates for all the major tributaries in the Lake Erie system in my Steelhead Guide, Fly Fishing Techniques and Strategies for Lake Erie Steelhead. These run-off rates (in hours, days and weeks) are generalizations and are based on an “average” run-off episode of an inch of rain (or equivalent snow/ice melt) in less than a 24 hour period for that particular watershed. The length of these run-off rates roughly correspond to the size of each tributary watershed with bigger tribs like Conneaut Creek, OH (3-4 days) encompassing large watersheds and smaller tribs like 12 Mile creek (less than 1 day) draining smaller ones. If you know the ideal flow conditions for a specific tributary (again refer to the Steelhead Guide book for this info) you can predict prime conditions during the course of a run-off episode for that tributary by monitoring its real-time flow data on the internet as it progresses from peak run-off to prime conditions and eventually to low and clear flow. Even if the particular tributary you are interested in does not have a river gage on it you can predict its ideal flow by relating it to a river that does. You can do this by relating the flow performance of this nongaged tributary to a nearby gaged tributary of which you are very familiar with its flow levels. In other words you’ll have to fish both tributaries the same day to make the correlation. This is not an exact science though because weather systems can affect tributary watersheds in the Great Lakes region differently dropping more rain for instance west versus east (or vice versa) as they pass through. Therefore it is critical to follow weekly weather reports, watch regional radar displays for precipitation and monitor local 24 hour rainfall amounts as reported by the weather bureau to more precisely determine the location and amount of precipitation that has fallen. Calling local tackle shops and resident steelheaders is also very helpful in getting up-to-date information on weather systems as well as water flow and clarity conditions for specific tributaries. Snow or ice melting very quickly due to rain and/or rapidly increasing air temperatures (occurring both during the day and night) can cause tremendous run-off especially if heavy snow pack and ice accumulations exist. This obviously spikes the river gages to extreme levels and prolongs the run-off rates. Ideally you want a slow melt of snow and ice during the winter months with moderating air temperatures during the day (30’s and 40’s) to allow for a slow melt and sub-freezing temperatures at night to keep the run-off in check. This type of melt run-off typically runs clear to moderately stained as well as ice cold, keeping the tributaries fishable for extended periods of time. Being on a tributary during prime conditions does not guarantee steelhead nirvana though. A host of conditions can occur that can play havoc with your day including early fall run-off which can be very silty even at ideal levels due to summer silt accumulation, fall leaf-drop which can clog the stream with leaves hindering drifts and obscuring your fly, morning slush and ice flows which can make getting your fly on the bottom a challenge, spring smolt stockings and sucker runs which can make it impossible to hook a steelhead in some areas and unexpected run-off from bridge or road construction that is often a muddy mess ruining downstream fishing. Remember to respect your fellow fisherman, the private landowner and the magnificent steelhead itself when out on the tributaries this season to help ensure a better experience for all. 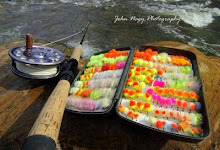 More detailed information on fly fishing for Lake Erie steelhead can be found in John Nagy's classic book "Steelhead Guide, Fly Fishing Techniques and Strategies for Lake Erie Steelhead". 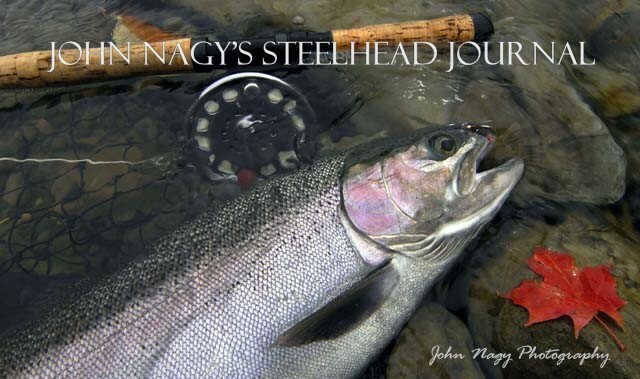 Look for John Nagy's new book the "Steelheader's Journal" coming out this November.